1997 is the 450th celebration of the birth of one of the greatest Spanish writers in the history of the world. His most famous literary work , The Quixote (a.k.a. as El Quijote in Spanish), sets him apart; making the birth of Don Miguel de Cervantes y Saavedra, a truly world class celebration. It is not known for certain the exact date of his birth, but since according to Spanish tradition the Christening was carried through very closely after the birth, there is no doubt that his birthday was in 1547. 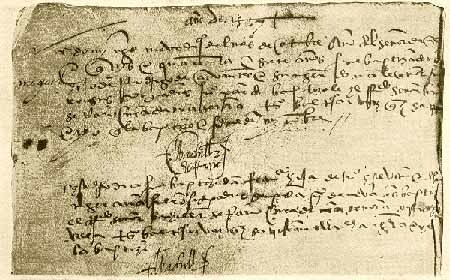 The actual date of the Christening was October 9th, 1547 at the city of Alcala de Henares. Since then, little is known of his childhood, other than he lived with his family in Valladolid, Madrid, and other Andalusian cities. Finally, they settled in Madrid, and afterwards, he became the attendant to the Cardinal Acquaviva in Italy in 1569. Later on, Cervantes enlisted in to armed forces for the naval Battle of Lepanto (it took place on the 7th of December of 1571) where he was injured. This meant the handicap of his left hand, but he still continued as a soldier, on his voyage returning to Spain 1575 in the galley Sun, he fell prisoner of the Turks when it was over powered. The next five years, Cervantes is a prisoner of war in Algiers, from where he tried to escape four times jeopardizing his life. Finally the Trinitarian fathers achieved his release from captivity, and Cervantes returns to Madrid. In 1584, a daughter out of wedlock is born to him, her name was Isabel, and that same years he marries Catalina of Salazar. He publishes the novel La Galatea, and opens several of his comedies without any success. Cervantes becomes a public official and travels through Andalusia collecting rents, and gathering goods for the then Invincible Armada (a.k.a. the Spanish Armada). These were tasks he did not enjoy in any way, since the numbers and administration were not his trade. Thirteen years later, Cervantes is thrown into jail in Seville, where he was held for three months, and being that his case was too complicated; he then is set free before going to trial. He settles in Valladolid in 1604, and obtains the rights to publish El Quijote (El Quixote), which first edition hits the streets a year later. Due to some uncertain matters, Cervantes lands once again in jail, this time with his sister and daughter as well, but not much later all three are absolved from all charges. 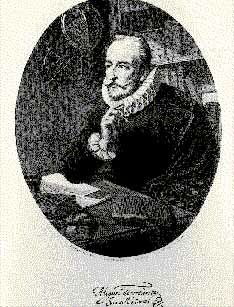 By 1608, Cervantes and his family settle once again in Madrid. By this time, Cervantes pours himself into his literary works and enters a pious brotherhood. Even though by now, he is famous both within and without, Cervantes leads a simple and poor life. There exists the anecdote when he was visited by a French delegation from the embassy, and they asked puzzled "And this man is not rich and supported from the public coffers?" 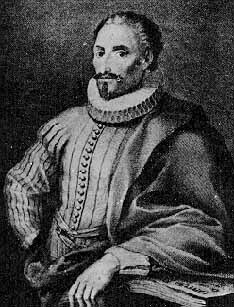 Four days after finishing his novel Persiles & Segismunda (The Travails ofPersiles & Sigismunda), and precisely the same day that another erudite, William Shakespeare, Don Miguel de Cervantes passes away in Madrid on the 23 of April of 1616. Cervantes tried as hard as he could to be a good poet "the heavens would not grant me such grace"--as he would often say--but the great bulk of his works have been lost. Only two songs of his remain both dedicated to the Invincible Armada (the Spanish Armada), and the poems within the novel of La Galatea. His best lyrical moments produced sonnets such as To the Catafalque of King Philip in Seville. However, most of the surviving pieces of his lyrical pieces are just fragments that maintained the traditional classical Italian form. The Theater, for economical reasons, was a big part of his dedication at one time in which he became the fashionable at the Comedy Theaters, and that at the time, it was beginning to settle a trend that encouraged the public's attention. Of these pieces only the Numantina and The Treatment of Algiers. But not long after, Cervantes had to surrender the stage after Lope de Vega's style became the new trend. Clearly antiaristotelian, and contrary to the system used up to then, only ten comedies of this time are known ten comedies (of which we should mention Gallardo Español--Gallant Spanish--, Los Baños de Argel--The Baths of Algiers--, or El Rufian Dichoso--The Lucky Cur--)and eight "entremeses" (a.k.a. "pasos" and named so for their brief representations, something close to a theatrical/comedic sketch). In them, Cervantes used a fine tuned and fast dialog; and able finisher of the theatrical play Lope de Rueda (subtle game of words meaning Lope of the Wheel). Also it is important to note that Cervantes introduced into the entremeses new elements from the novel from, such as the simplification of the action, descriptions typical of novels, and a depth to the characters used. He was able to do so brilliantly, accomplishing in this way, clear pictures of the everyday life of his time. Important to note would be El Rufián Viudo--The Widowed Cur, El Retablo de las Maravillas--The Altarpiece of the Marvels, or La Guarda Cuidadosa--The Careful Watch. The novel is his truly authentic epitome. Occupying a very relevant place in world literature, Cervantes exceptional and humorous narratives showcase his time period. Within the prominent novels, these deserve careful attention by the reader: La Galatea (1585). Other novels from the 1613 period would be: La Gitanilla (The Gypsy Girl); El Amante Liberal (The Liberal Lover); Rinconete y Cortadillo--here Cervantes shows us his weakness for witty villains--; La Señora Cordelia (Mrs. Cordelia); La Española Inglesa (The English Spanish Lady); El Licenciado Vidriera (The Bachelor Vidriera); La Fuerza de la Sangre (The Strength of Blood); El Celoso Extremeñ (The Jealous Extemeñ); El Casamiento Engañoso (The Deceptive Wedding); Coloquio de los Perros (The Talking Dogs); Pesiles y Segismunda (The Travails of Persiles and Sigismunda). This last one was published in 1617. The latter works especially are the best testimonials, not only of the surviving Greek themes, but also of the forms and ideals of the Spanish novel of the Second Renaissance. At this point, we are going to center in Cervantes' literary masterpiece: El Ingenioso Hidalgo Don Quijote de la Mancha (The History of the Valorous and Wittie Knight Errant Don Quixote of the Mancha). Part I was published in 1605, and Part II in 1612. From the beginning the novel was an immediate success. The first translation into the English language was undertaken by Thomas Shelton (Part I in 1612, and Part II in 1620). Since its first publication, Cervantes' novel has continued to inspire other artist from around the world. This novel has been translated into Italian, Russian, French, just to mention a few. It has been made into a play, a ballet, an opera, films, a musical, and a tone poem just to mention a few. It has inspired artists such as Strauss, Falla, Massenet, Daumier, and Doré, amongst others. And even today, Cervantes continues to influence the Spanish culture. The Cervantes Institute, one of the standards of the Spanish culture and letters around the world, following on the principles of the master, makes possible, through a myriad of activities, the diffusion of the spirit and dignity of our language to all of the corners of the earth. Annually, the Cervantes Prize, sponsored by the Spanish Ministry of Culture, offers the highest honor of the Spanish language to one literary work following the footsteps of the spirit of the "El Quijote".